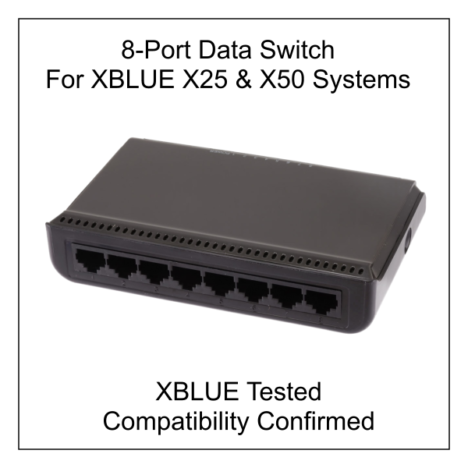 Use this 8-port switch you to connect (7) XBLUE IP Phones such as models X2020, X3030, X4040 and Ip7g IP phones. The 8th port allows the switch to be connected to the network. Each of the 8 ports has a speed of 100/1000 Mbps. Compatibility Note: This device is compatible with the XBLUE X25, X50 & QB systems. No programming is required. This device is not compatible with the XBLUE X16 system. If you are attempting to expand an XBLUE X16 Digital System you may want to take a look at the X16 4 Phone Connector. It is used to expand the number of extension ports of the X16 Digital System server.